VO-52 seems to be down, it hasn’t been heard in the last couple of days. I hope that the ground station in India will give some information about the status of this great Satellite soon. 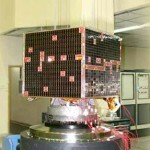 This entry was posted in Satellite and tagged Hamsat, ISRO, Not Heard, VO-52 by PE0SAT. Bookmark the permalink. VO-52 seems to be back on. Here in Copenhagen at AOS 0704 UTC. 6 kHz op on the uplink to get right. The beacon is also higher in frequency.